Welcome to The Singleton Co. 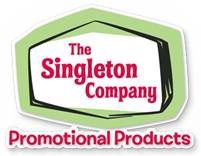 The Singleton Company is a full service marketing and promotions agency specializing in promotional products. We have over 2500 active clients, ranging from small firms to Fortune 100 companies. Whether you are looking for tradeshow giveaways, hot new TECH PRODUCTS, or Banners and Displays – our experience and wide range of merchandise will accomplish your branding message.